Suspension of disbelief in movies is a strange thing. Take Godzilla for example. Once one accepts the idea of a lizard which has mutated into a forty-storey high monster because of French nuclear testing, it follows that one should accept what comes next. But I simply couldnt do it. I kept on applying logic and common sense where the film-makers would rather I hadnt. The biggest problem is that the director Emmerich (Independence Day) should have taken his movies tagline of size does matter more seriously. The Godzilla monster seems to change in size from scene to scene. On the one hand hes large enough to demolish entire skyscrapers, on the other, he (it?) can blithely hide away in the narrow tunnels of the subway. In one scene we see him noisily and clumsily wandering through New York, unintentionally destroying buildings and property in his wake. The next scene hes agilely dodging an entire swarm of helicopters while running through the city. And the list goes on. The movie should have been titled Godzilla - the Amazing Shrinking and Resizing At Will Gecko. Oh, and Teleporting. In one scene he not only outruns helicopters, but magically appears from behind them to swat them from the air. This specific scene had me laughing out loud - Im terrible in that way. How Godzilla (hes just an animal after all, the Matthew Broderick character informs a general) outwits the American army has to be seen to be believed. Fly above the buildings, not between them, you idiot! I mentally admonished an onscreen helicopter pilot. Alas, the idea never occurred to the pilot and his helicopter got swatted by Godzilla. "It had me laughing out loud - I'm terrible in that way . . ."
But Im getting carried away here. The point is that Godzilla isnt any of the things mentioned above. He should rather be called the Lizard Who Does Whatever The Screenplay Writers Demand Of Him to Develop The Plot. And the plot isnt so hot, Im afraid. If you think the idea of New York being trashed by a gigantic lizard is exciting, then wait till you see what the makers of this movie does with it: it is dead dull and predictable, consisting of bits stolen from other (better) movies. Godzilla looks like an Alien crossed with the T-Rex from Jurassic Park, the egg scene was stolen from Aliens, where the baby zillas hatch was nicked from the Velociraptor scene towards the end of Jurassic Park. In fact it steals most of its ideas and imagery from Jurassic Park and its sequel The Lost World. Like the latter film, it is always dark and murky. 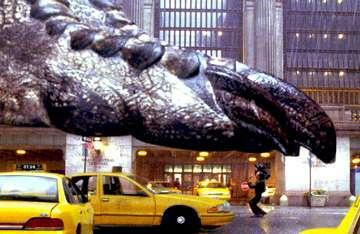 Compare the scene in which the films heroes are chased around in a yellow taxi cab by the creature: almost identical to a scene in Jurassic Park. And I can go on, but I wont. To be honest I felt vaguely insulted by this movie . . . does Devlin and Emmerich really think audiences are this dumb? Never being too much of a fan of their work (their stuff is mind-boggingly unoriginal) I must say that Godzilla is definitely their worst movie yet. Yup, worse than Universal Soldier, StarGate and Independence Day. By the way, if you hadnt caught it: in the movie, New Yorks idiot mayor and his sidekick are spoofs of Siskel & Ebert, no doubt because these two well-known American film critics didnt like any of Emmerich and Devlins previous movies. But Siskel & Ebert shouldnt feel alone: I dont like their movies either . . . But to be fair, kids in the audience I was in were enthralled by the noise and spectacle of it all, so I rated Godzilla two stars. Im fair that way. But if youre an adult, it rates a definite one star . . . be forewarned . . .
Read The Nitpicker's Guide to Godzilla. Read our review of Godzilla on Blu-Ray.